There is emerging evidence that lncRNAs can be involved in various critical biological processes. Zebrafish is a full-developed model system being used in a variety of basic research and biomedical studies. Hence, it is a good idea to study the role of lncRNA using zebrafish as a model. 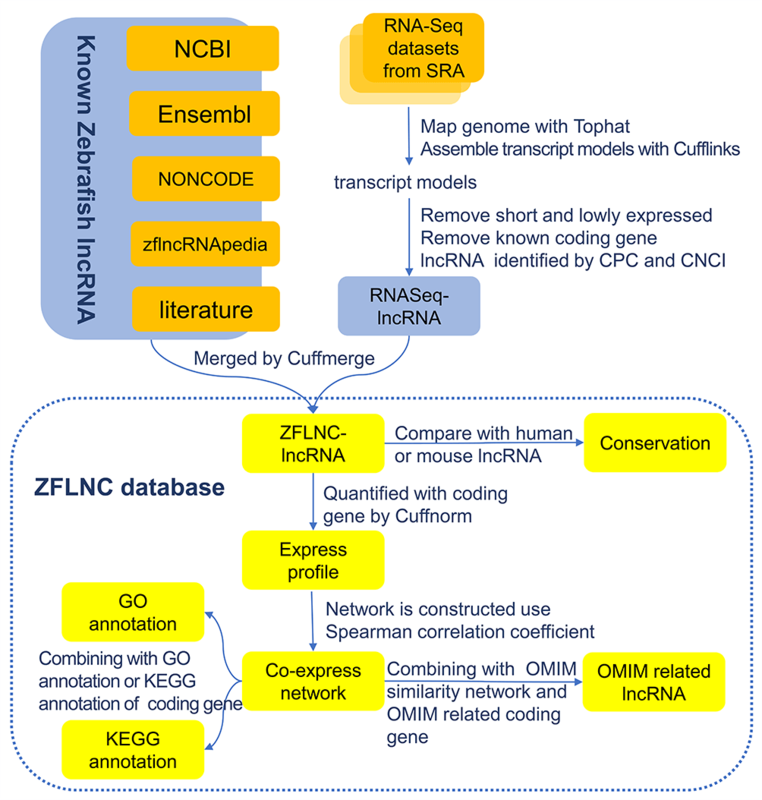 Here, we constructed ZFLNC -- a comprehensive database of zebrafish lncRNA that is dedicated to offer a zebrafish-based platform for deeply exploring lncRNA function and mechanism, to the relevant academic community. The main data resources of lncRNAs in this database come from NCBI, Ensembl, NONCODE, zflncRNApedia and literature. We also obtained lncRNAs as a supplement by analyzing RNA-Seq datasets from SRA database. We carried out the expression profile, GO annotation, KEGG pathway annotation, conservative analysis and OMIM annotation for those zebrafish lncRNAs. In the current version ZFLNC contain 13,604 lncRNA genes and 21,128 lncRNA transcripts. Browse all lncRNA genes or transcripts. Search an entry or a subset of the database. Find regions of similarity between your sequences. Convert ZFLNC ID and other databases ID. The basic statistics of the ZFLNC database. Find all features in specific location of genome. Browse putative omim related zebrafish lncRNAs. Download the information in ZFLNC. More information and usage of ZFLNC database. The expression information of lncRNA genes in tissues or embryo and the predicted RNA secondary structure for lncRNA transcripts was added. The advanced search was added to ZFLNC. Modify the appearance of the website. The first version of ZFLNC was publicly released. ZFLNC database website on line. State Key Laboratory of Developmental Biology of Freshwater Fish, School of Life Sciences, Hunan Normal University. Key Laboratory of Tropical Plant Resources and Sustainable Use, Xishuangbanna Tropical Botanical Garden, Chinese Academy of Sciences. © 2016-2018 zflnc.org, All Rights Reserved. Any comments and suggestions, please E-mail us.